Coupon Strategy is one of the most common small business mistakes to avoid. Your coupon strategy should be more than just a way to get new people in the door. And it doesn’t have to cheapen the place. 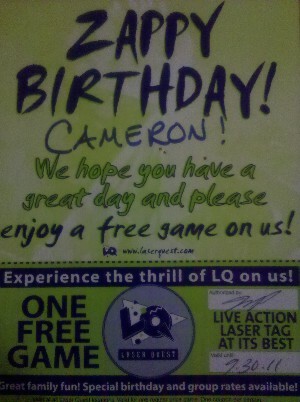 Take a look at this coupon we received from Laser Quest Nashville after attending a birthday party recently. You can probably argue that the copy isn’t good and the 4″ x 6″ size isn’t perfect. And if this were a marketing piece we received in the mail – I’d listen to your argument. But that’s not what we’re looking at today. The “Gold” is in the bottom right hand corner. The birthday and special group rate reminders across the bottom are often overlooked by business owners. If your name is going to be hanging on your customer’s bulletin board for month’s on end – don’t forget about the messaging opportunity. Closing a sale is hard; don’t let anyone tell you differently. Sometimes what people need is that sense of urgency to actually make a decision. An expiration date can do just that and is something often left off – making it one of the small business mistakes to avoid. With an offer like “one free game”, failing to put that date on may mean the coupon sits on the bulletin board forever. While the object isn’t to just give away free anything, it’s nice to reward customers – and nicer when they bring a paying friend. The other huge benefit is forcing customers to make an extra trip. Without an expiration date we could easily wait until my next child’s birthday and reduce our overall birthday party cost. For the business that is a losing proposition because, in our case, the coupon didn’t convince us to go. And using it when we were going anyway doesn’t help. Since my other son’s birthday isn’t until December, and this expires in September the kids are going to get an extra fun day out with dad. That’s a bonus for us and a bonus for Laser Quest Nashville. Coupons do come with problems – but most of the time customer service can turn those into success events. For instance, you’re always going to run into the person who wants to use it after the expiration date – and that’s truly a decision you’re going to have to make as a company. Was the coupon intended to inspire the customer to come in during this period? Or was it used to get the customer to come in? What are your thoughts on using coupons after the expiration date? And when shouldn’t a business use a coupon?